Fender Acoustic guitars announced several new models for the summer. 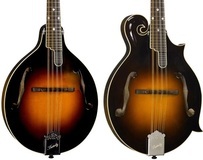 The Loar is giving away the LM-500 Golden Age mandolin to celebrate its reissue. The Loar released their first x-braced A-model mandolin, hand-carved at The Loar Hand Carved Workshop, the birthplace of the LM-400, 600 and 700 mandolins. Gibson Original announced the introduction of the Limited Edition Gibson Victorian F-style Mandolin with only 15 available in the world.